I’ve been crazy about being outside since I was old enough to proclaim my wishes to the world, and to propel myself on two legs. Although I have other interests, I always seem to gravitate back to the out-of-doors– exploring, learning, drawing, writing, explaining my passion for all things natural to others. Hiking has always been my first love, probably followed by botany. Both of these were put on temporary hiatus while raising a family of boys, without a camper or plant lover in the crew. However, boys grow up! I quickly re-trained the husband to expect my disappearance for long stretches in the woods, and a childhood friend and I began hiking the 4000-mile North Country National Scenic Trail. Soon I was writing about that experience as well, and have now written the first book by a hiker of that trail, North Country Cache. If all goes as planned, I will also be the first woman to hike the entire trail, officially finishing my quest in August of this year, 2010. Joan H. Young: “Never do anything twice,” seems to be my life mantra. I have a collection of self-published and self-printed items. In 1986 I wrote and self-printed a collection of short biographies of historical Christians, called Would You Dare?. It continues to sell a few copies here and there. I have also self-printed a booklet, Devotions for Hikers, weighing under 2 ounces— perfect for backpackers. I’m also a word puzzle aficionado, and have created two booklets of puzzles for outdoor lovers. My biggest project is North Country Cache, a collection of essays recalling 2300 miles of hiking on the North Country National Scenic Trail. Each hike develops a unique feeling, and the reader can experience the joys, the pain, the relationships, the blisters, the jokes, and the never-to-be-forgotten moments of life on the trail. I am continually amazed that I actually finished a project of that size, and readers assure me that it was a worthwhile endeavor. Joan H. Young: I am currently writing and illustrating a children’s book called Moose in Boots. Morgan, a teenage moose, is sent by his Mama into the northwoods to learn how to be a grownup moose. But Morgan has to learn some lessons before he is comfortable with himself. My hope is that this will be ready to go to a publisher this year, but completing the hiking is my highest priority. , which will chronicle the remainder of my journey on the North Country Trail, is in progress. It can’t be completed before I finish the hiking! Don’t expect to see it for at least a year. It is titled North Country Quest. 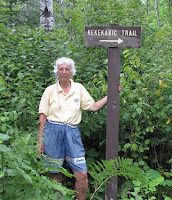 Joan H. Young: I won a few writing contests as a child, but the one that means a lot to me is that North Country Cache won an Honorable Mention from the Independent Publishers Association in 2005, for Regional Great Lakes entries. Joan H. Young: I joined Accentuate Writers Forum soon after it was launched, but didn’t really become active there until the fall of 2009. I was doing a lot of ghostwriting and writing for web sites, and was feeling really stifled. With the encouragement of forum founder, Michy Devon, I’ve started writing a bit of fiction again and have entered a few of the short story contests they sponsor. This has helped me feel that perhaps I do have a drop or two of creative energy left. Joan H. Young: It would be impossible to pick a favorite book or author, as a child or even now. My favorite genre is the one I am reading at the moment. When I wasn’t outside (and sometimes when I was outside!) I always had my nose in a book. As I look back, I blame part of my case of terminal wanderlust on John Steinbeck, and Travels with Charley. I read this atypical Steinbeck when I was 12, and ever since have been drawn to books by travelers who have a knack of sharing their encounters with readers. Favorites include Peter Jenkins, William Least Heat Moon, and Brad Herzog. How has having a book or being published in a book changed your life? Joan H. Young: Having a book to show people has given me a lot of credibility. I’ve now sold over 1000 copies of North Country Cache, which isn’t bad for a self-published book being promoted by a sloppy marketer (me). People tend to think of this as a niche book, only of interest to hikers. In truth, it avoids hiker lingo, is not a trail journal, and is really a book about life. There are sections for nature-lovers, history buffs, and a fair amount of humor. Since it is presented in short eclectic essays, if you don’t like one chapter there is always hope for the next one! I sense that people treat me differently with a book in my hand. Lots of people say, “I’m writing a book.” Heck, I used to be one of them. But now, I have accomplished that. It makes a difference. 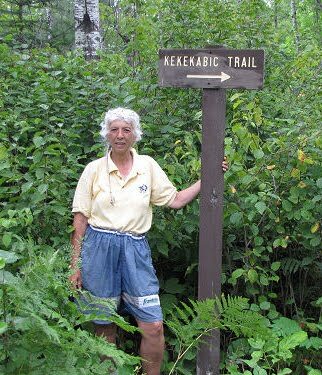 I am finding that as I come closer and closer to being one of the first 10 people to hike the entire NCT, and the first woman to do so, that I am getting even more respect. I want people to learn about the North Country Trail, and to discover what a treasure it is. Everyone has heard of the Appalachian Trail, the Pacific Crest, and Continental Divide. But few people know about the NCT, and even fewer believe that it would be possible to have an interesting trail run through the Northeast/ Midwest United States. A part of me enjoys the small pond celebrity status, I have to admit. But that is more about the satisfaction it brings me to know that I can make people feel things, care about causes, learn new facts, and stretch their own limits, rather than wanting to be adored. Joan H. Young: I chose to self-publish because I knew that this was going to be perceived as a niche book, and the style— essays of assorted styles— was not a common format. As it turned out, I really enjoyed the publishing process. I found two people, one who does some professional editing, and the other a former English teacher, to edit my manuscript. Both were loving but brutal. My ego survived and the weak essays are better and the strong ones are really good, thanks to their guidance. I liked working out the formatting, chasing down permissions for lengthy quotes, selecting a printer, creating the locator maps, and all of the parts of the production that go beyond the writing. The whole project got very rushed at the end because I was trying to have the book available for the 25th Anniversary of the Trail conference. The deadline was met, but I think I’ll take the sequel at a slightly slower pace! Everyone wants to know what I am going to do after I finish hiking the trail. I’ll never run out of trails to hike! There are several connector trails to the NCT, sections which have been moved off road since I hiked there, and thousands of other interesting places to visit… and write about! I’m hoping to be able to support this wanderlust habit by means of continued writing. For more information about programs that I give, book promotions, signings, and sales, go to http://booksleavingfootprints.com, then click Meet the Author. You can also read a sample chapter of North Country Cache.